Justin Brackett, a 29-year-old lawyer who passed the bar in 2012, works for the law office of N.C. House Speaker Tim Moore. Brackett just lost a very close election for one of North Carolina District Court Judge District 27B seats. Moore donated $5,100 – the legal maximum – to Brackett’s failed judicial campaign, during which Brackett was accused of juicing his resume and ended up changing his job description on his campaign website. 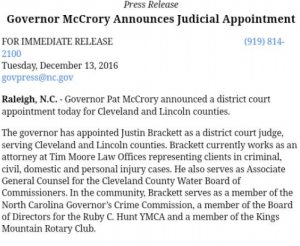 Though the official appointment press release notes Brackett’s employment at Moore’s law firm, his bio appears to have been removed from the firm’s website. The Shelby attorney, who possesses degrees from North Carolina State University and the Oklahoma City University School of Law, worked on state Rep. Tim Moore’s first re-election run and then ran Les Merritt’s unsuccessful state auditor re-election campaign in 2008. If the 29-year-old Brackett is able to win voters on his behalf this November, though, he first must convince them that his legal experience over the past four years makes him qualified to serve the people of Lincoln and Cleveland counties. Brackett is running for district judge against Meredith Shuford, who has held her District 27B post since 2007. His campaign website labels his campaign as one for “a conservative judge for Cleveland and Lincoln Counties” and he once had aspirations of running for legislative office. Brackett has stopped by numerous Republican Party events in the past few months and took a photo at the Lincoln County Reagan Day dinner alongside Republican legislators Moore, Lincoln County state Rep. Jason Saine and Lincoln County state Sen. David Curtis. Brackett works for Moore, now the state Speaker of the House, in private practice. In his most recent campaign finance filing, Moore was Brackett’s only contributor, and he donated the maximum $5,100. And the crap just keeps on coming!